These are just a few of the names of people who have been killed or seriously injured working around bunker and pile silos. Keith and Ruthie Bolsen can rattle these names off as fast as the names of those in their own family. They’ve talked to the survivors of silage accidents and to the family members of those who didn’t survive. You see, silage safety is a personal mission for the Austin, Texas-based couple. Most people in the forage and livestock industries know Keith for his 32-year career as a professor at Kansas State University. It was there that he put his “hard science” training to work by teaching cattle nutrition and silage technology. Along the way, he mentored hundreds of students. Following his retirement from KSU in 2003, Keith has continued to consult in the area of silage management. Also during this time, Keith and his wife have become the nation’s First Couple of silage safety. In recent years, the Bolsens have given presentations, developed written materials, and created a video highlighting the need for safe practices when working around silage. 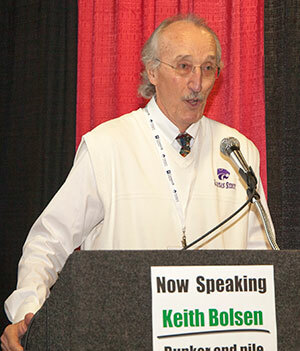 At World Dairy Expo in Madison, Wis., earlier this month, they took their efforts to the next level, announcing the formation of the Keith Bolsen Silage Safety Foundation. The Bolsens take this mission personally. They’ve talked to and experienced the pain of injury and death with family members of silage accident victims. These number not just farm workers but also the likes of professional nutritionists and agronomists, who may be on a farm to pull silage samples from the face of a bunker or pile. 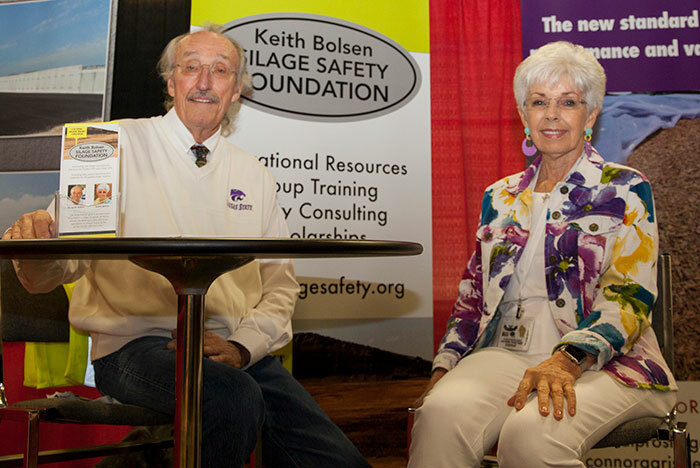 Detailed information on the Bolsen’s foundation can be obtained on its new website, silagesafety.org. The Silage Safety Foundation intends to provide educational resources in the form of written and multimedia materials, site-specific consulting for farmers and ranchers on safety protocols, safety presentations, and offer train-the-trainer workshops for industry professionals and livestock organizations. Of special note is the foundation’s aim to provide scholarship funds for family members of silage accident victims. The Bolsens and their foundation’s board of directors are seeking contributions to further their mission and goals. “This is a big challenge and to make progress it’s going to take an industry-wide effort,” Ruthie said. Individual and corporate sponsorship opportunities for the foundation, which is set up as a 501(c)(3) corporation, are outlined on the website. Donations are tax deductible. In his presentation from the Forage Seminar Stage at World Dairy Expo, Keith noted that the potential for silage accidents are far reaching. They include accidents caused by fatigue, complacency, truck and tractor rollovers, runovers, machine entanglements, falls from heights, crushing from a silo avalanche, and silo gas poisoning. He and Ruthie have had far too many personal experiences with all of these.